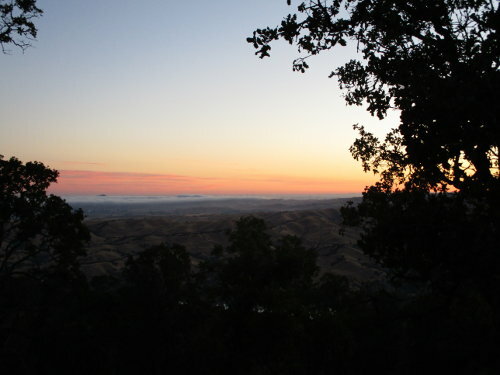 Posted on December 28, 2018 by Sara K.
At Boyd Camp, I only had a few miles left of the official Ohlone Trail, and they were all downhill! After the work my legs did the previous day, this seemed pretty great. 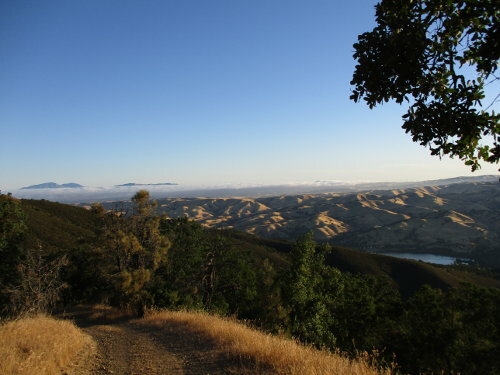 On the left you can see Mount Diablo, and on the right you can see Del Valle Reservoir. 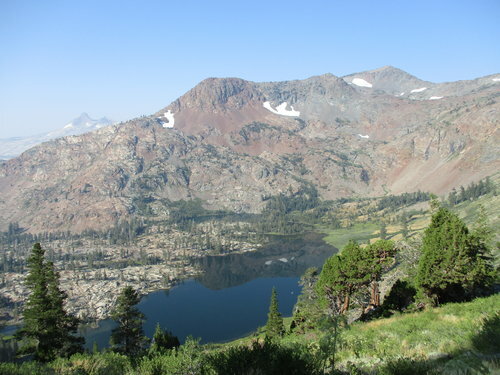 Posted on December 21, 2018 by Sara K.
In Part One, I embarked on my hike of the Ohlone Trail in Alameda County, and reached Sunol Backpacking Camp. 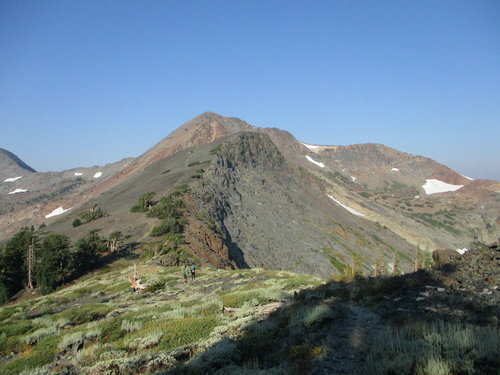 In this part, I describe my hike from there to Boyd Camp. 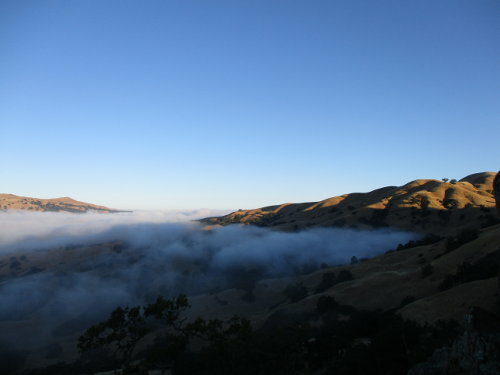 When I woke up at camp, I got to see a lot of fog in the Sunol Valley. Posted on December 14, 2018 by Sara K.
This is what the East Bay (that is, the eastern side of the San Francisco Bay) looks like in summer. 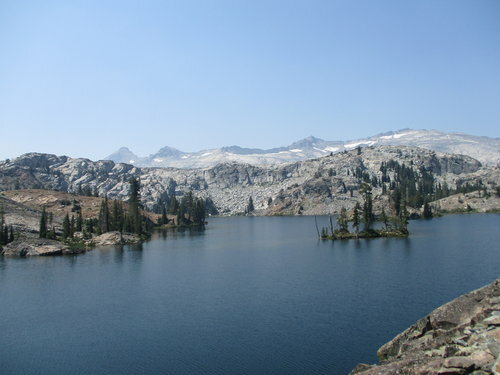 Even though Alameda county has a population of 1.6 million people, a lot of it is still like this. 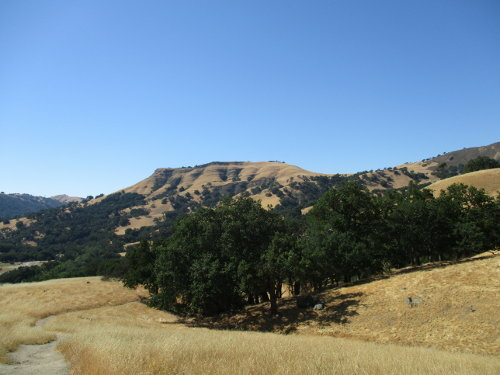 This June, I hiked the entire length of the Ohlone Trail. 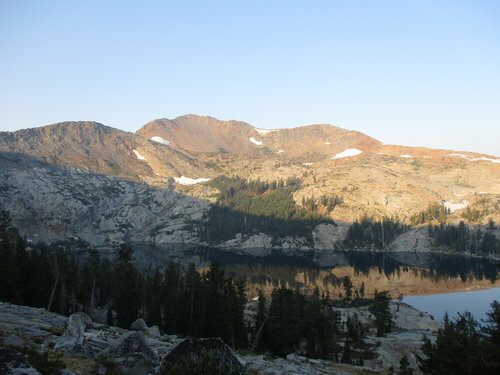 I had several goals: 1) I did not distinctly remember staying overnight in Alameda County even though I know I’ve spent many nights there 2) I had just finished sewing my net-tent and I wanted to test it out before hiking a few hundred miles with it and 3) I wanted to prepare myself physically for hiking a few hundred miles. Posted on September 28, 2018 by Sara K.
I took this photo at the Salesforce Transit Center in San Francisco two weeks ago. A month and a half ago, the glittering new transit center in San Francisco somehow managed to open. And a couple days ago it suddenly closed. I was quite surprised when the transit center opened in the first place, because I’ve been trained to believe that these projects are never finished. I was also surprised when the Salesforce Tower was finally finished because I expected that to take forever too. However, though I would not say that I ~expected~ engineering problems, I’m not terribly surprised that the center was closed less that two months after it opened. When I was in Taiwan, I remember going to some exhibit about bridges. They had photos of bridges all over the world, including the east span of the Bay Bridge, and I was surprised that the Bay Bridge did not look at all how I remembered it. Then I looked at the caption, and realized it was the new Bay Bridge which, as of the time I was living in Taiwan, I had never seen before. They had been working on the new eastern span of the Bay Bridge since the bridge was broken in the 1989 earthquake, they had been building it when I was in middle school and high school. The cost overruns were a well known joke, and the consensus when I was in high school was that the new bridge was sucking up so much money in exceeding its budget again and again that, if the bridge were ever completed, it would not have been worth the ridiculous cost. For as long as I remember, they had been working on a bridge which was a vortex of wasted money which kept on being delayed and delayed, so I was shocked to learn in Taiwan that the new bridge actually was completed, and being used by the public. And of course, given that it took more than twenty years to build the new bridge and it cost way more money than anyone predicted, it had engineering failures as soon as it opened which were expensive to fix. Fortunately, since the Temporary Transbay Terminal (which is where the buses stopped before the transit center was complete) is still there, it was possible to quickly reroute all of the buses quickly, and restore things to the way they were two months ago – except most of the signs had been removed, which meant that most passengers did not know where their bus was supposed to stop. I took this photo at the former Greyhound terminal in San Francisco about a month ago – except Greyhound has now moved back in because the transit center is closed. You can see the Temporary Transbay Terminal on the other side of the glass doors. The building was never this empty when it was an active Greyhound stop. 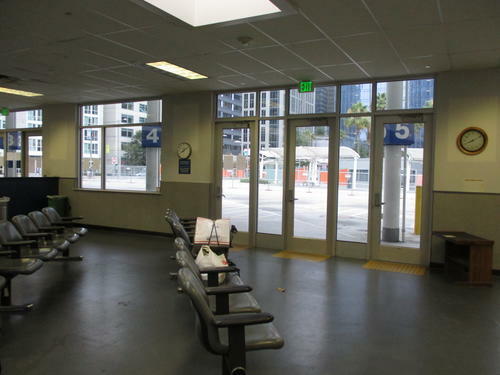 Until a few days ago, Amtrak was the only service which was still available at the Temporary Transbay Terminal. The Amtrak ‘station’ used to be a small room in the Greyhound terminal, but since Greyhound moved out, Amtrak got to take over the entire building. During my most recent trip, I was not sure where the Amtrak stop in San Francisco was going to be when I returned because Amtrak had told me they might move their stop any day (it turns out they did not move). When I got back to San Francisco, they had even closed the bathrooms in the Temporary Transbay Terminal (which I think was rather rude given that Amtrak was still operating there), so I had to walk all the way to the new Salesforce Transit Center to relieve myself (another problem with the new transit center is that the signs which are supposed to indicate the bathrooms are very confusing). 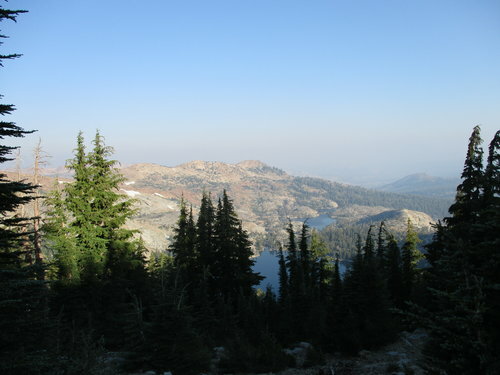 That is when I took the photo at the top of this blog post. For Amtrak passengers, it’s rather inconvenient that Amtrak stops in a location which is no longer served by any other form of public transit (though it’s only a block and a half away from the new Transit Center, and a few blocks from Embarcadero Station, so it’s not terrible). Of course, with the closure of the new transit center, there is now a lot of public transit at the Temporary Transbay Terminal again. According to the Amtrak employees I talked to, the reason why Amtrak stayed at the Temporary Transbay Terminal while every other service left was that the Salesforce Transit Center was going to charge Amtrak more than Amtrak was willing to pay to lease a ticket office. Like a lot of locals who ride Amtrak, I am rooting for Amtrak to forget about the Salesforce Transit Center and lease a ticket office at the Ferry Building, which used to be Amtrak’s official stop in San Francisco. A lot of bus lines go the Ferry Building, all of the ferries go to the Ferry Building, and it is right next to Embarcadero Station. 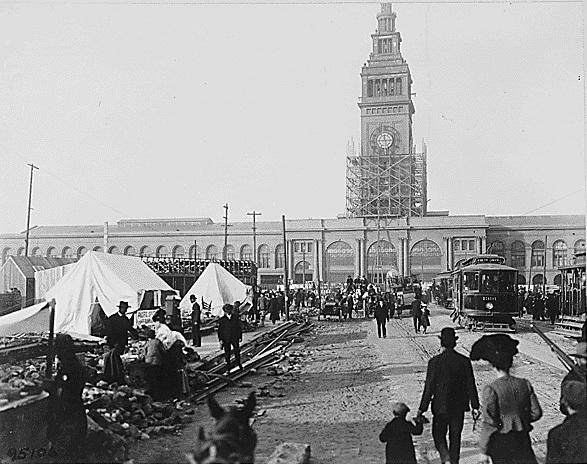 A photo of the Ferry Building taken shortly after the 1906 earthquake and fire. Notice that the Ferry Building is intact, and that there is a lot of rubble in the lower left part of the picture. The people behind the new Salesforce Transit Center say that it will become “Grand Central Station of the West.” The irony is that the “Grand Central Station of the West” used to be the Ferry Building. Before the completion of the Golden Gate and Bay Bridges, the Ferry Building was the second busiest passenger terminal in the world (the busiest was Charing Cross Station in London). It was the most expensive public building built in San Francisco in the 19th century (though I doubt it has as many cost overruns as our new transit center or our new Bay Bridge), and it was so well built that it go through the 1906 earthquake and fire and the 1989 earthquake without major damage. The trains no longer run to the Ferry Building, and it’s not built to handle all of the transbay buses, but it seems like it was a more successful project than our new transit center. I also have a new appreciation for the Temporary Transbay Terminal. It’s cheap, simple, and a lot more foolproof than these fancy construction projects. Most of the terminal is an open-air bus staging area – very cheap to build and maintain, the roof can’t collapse because there is no roof. The building which used to be (and is once again) the Greyhound terminal is basically a one-story tin shed – cheap to build, simple engineering, the roof is unlikely to have too much load to bear because it is a single story structure. I do not miss the old Transbay Terminal (and I suspect renovating the old Transbay Terminal might have been just as much as a mess as building the new transit center), but maybe, instead of pouring lots of money into a fancy new transit center, it would have been better if the Temporary Transbay Terminal were in fact the Permanent Transbay Terminal and they did not build a new transit center at all. 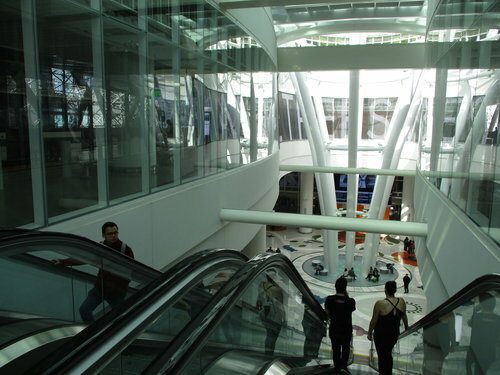 After all, the Temporary Transbay Terminal functioned well as a bus terminal, and that’s all we really need.